With no racing after today until Boxing Day this will be my last post until Friday when we will have some winning tips from Nick Hardman. But before I go I've got news of 12 super freebies that you can get, starting on Christmas Day. 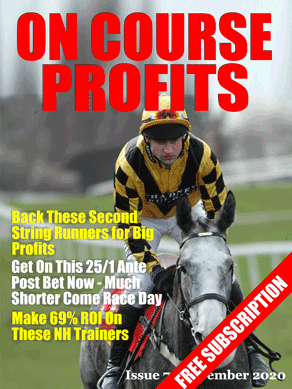 That nice Mr Wilding over at Race Advisor has managed to persuade the owners of the best premium betting services to give you access to ALL of them this Christmas, completely FREE. Michael is known for putting together offers of incredible value, but he’s really outdone himself this time and we’re proud to be a part of it. This is a one-off, unique Christmas event. You’ll get one email each day, for the twelve days of Christmas, showing you how to get access to a premium service totally free. But, you MUST register before midnight on the 24th December if you want to join in. We do a lot of “open” testing at the Grey Horse Bot web site sometimes just to see how a particular idea will work out (high strike rate favourites) and sometimes to test a new system idea that looks like it could work. Although it’s nice to see a profit from the testing sometimes the goal is just to see if a system is performing as expected. As you know not every system will make a profit every month so a trial period may not be profitable but if the system performs as it has in the past then that is a good sign. We started testing “Elision” back at the end of August. This was planned as a 3 month test just to see if the ratings system we were using to help find the selections did actually continue to work as expected. …Although because of the ratings we can still end up with more than one selection in a race. The test has been quite revealing which you can see if you study the results page. These along with the month by month and day by day results and the visual graph give you a good understanding of how the system is performing. Another thing we give our customers from time to time is a report about the test which includes information about how we feel the system had performed and there is also one of these available on the results page. I am not sure if Elision will appeal to everyone. But the fact that it made over 500 points last year and has still managed over 400 points this year should tempt you to at least have a look. You can get all this information here. ... ..., appeal, bank, bet, bot, Bot web site, column, customers, draw, eachway, eachway bet, end, fact, favourites, goal, good sign, good understanding, Grey Horse Bot, Handicap Hurdle, help, high strike rate, Highest Bank, horse, Horse Bot web, http://greyhorsebot.com, hurdle, idea, information, information here.